Everyone loves to look up at a beautiful star filled night sky. 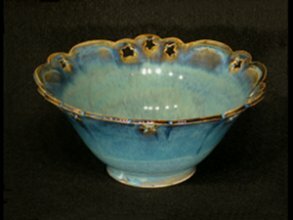 I have taken this theme and cut out three groupings of three stars, each with single stars in between, making a circular band on this bowl. I glazed it in my bright blue glaze with a dark rich blue rim. The rim is carved with curved “clouds” that the stars are scatterings. See below the sizes and prices. One color: Dark blue on bright blue.